In Jonah Hill’s case, his directorial debut MID90s fawns over familiar territory that anarchistic filmmakers like Larry Clark (KIDS) and Harmony Korine (GUMMO) were trotting down 20 years ago. His movie is a riff on the works of those who came before, being inspired by a mood, or a feeling than a specific style. There is an appeal to creating a character like 13-year-old Stevie (Sunny Suljic), a kid looking to fit in as he is discovering the adolescent boy he wants to become. He’s a latchkey kid with a newly reformed mother (Katherine Waterston in maybe four scenes) and likes to sneak around his Slim Shady-looking brother Ian’s (Lucas Hedges) room searching for gangster rap music. Stevie is a lonely boy searching for his tribe, longing to experience the more delicious aspects of being a teen. He’s kind of just stuck in an awkward in-between period in life; he’s not yet Ian’s equal (who ferociously pummels his little brother). He loves the idea of skateboarding, but doesn’t know how to harness the crazy amount of energy, so, naturally, he starts to vibe with the local skate shop group of “cool dudes.” The crew has about three-to-four years on Stevie in age and it just seems like they are amused by his willingness to take the hardest hits when the time comes. The group is led by Ray (Na-Kel Smith), who’s the best skater of them and knows he’s looking to turn his hobby into a job. The rest are camera guy “Fourth Grade” (Ryder McLaughlin, who seems to be the Jonah Hill stand-in), Ruben (Gino Galicia) and “F*ckshit” (Olan Prenatt), whose wildcard attitude shown against Ray’s ambition shows how friends come together and erode apart. MID90s despite its loose and vulgar feel is about learning how to fit in and knowing when to get out. Suljic is a priceless find. He brings a lowkey chillness to Stevie, who pretends he has it all figured out even though he’s not sure why anybody would want to be called “F*ckshit.” A nickname is a badge of honor, but not having one is even cooler. Hill’s movie isn’t looking at the era through amber colored frames. He uses the period as only a way to discuss NINJA TURTLE bed sheets, skate tapes and the absence of cellphones. Snappy titles aside, the narrative isn’t hampered by its nostalgia. 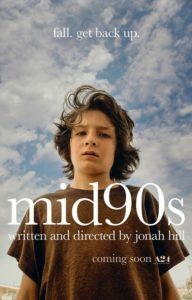 MID90s celebrates the reckless abandon of the pre-JACKASS home video days where a dare, or a rude slur to your best friend, can make or break your social credit score. Exploring meandering drama fits Hill’s improv comedy sensibilities well. He’s a voice that should be heard. MID90s premiered on Sunday, Sept. 9, 2018. The Toronto International Film Festival has an encore screening on 9/14. Visit tiff.net for more details on the showtimes. MID90s will release on Oct. 19, 2018 through A24.